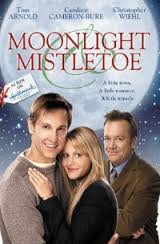 Moonlight and Mistletoe (2008) Rated TV-G | What to Watch. This isn’t one of my favorite Hallmark Christmas movies. It does have the traditional, wholesome romance within a Christmas setting. However, the movie doesn’t revolve around the romance; it concentrates more on the business side of the story and the father/daughter relationship. Although it has all the formulaic sweetness of Hallmark and a unique perspective, I still thought it was uninteresting and unoriginal. On its own merits, despite my feelings, I would recommend it as worth a watch, though. This entry was posted in 2008, Christmas Films, Drama, family, films, hallmark movies, Movie reviews, movies, Rated TV-G, reviews and tagged business, candace cameron bure, Christmas, christmas films, christmas movie, christmas movies, Christopher Wiehl, daughter, father, favorite, film, film reviews, films, hallmark, Hallmark films, hallmark movies, home, Matt Walton, Moonlight & Mistletoe, Moonlight and Mistletoe, movie, movie reviews, movies, relationship, romance, story, Tom Arnold, trailer, village, worth, year. Bookmark the permalink.